Q.: How long have you worked in estate agency? A.: That would be… 31 years! Time just flies, doesn’t it?! I have been working on the local property market in various roles and you might think I’ve grown tired of it, but actually, I kept my passion and enthusiasm because every home and every person I meet are unique in their own ways, you never know what the next phone call will bring. Q.: What does a regular day look like for you at Caledonia Property? A.: In a nutshell, I do my best helping Caledonia’s clients achieve their property goals. My biggest responsibility is to visit clients’ homes and make an accurate, up to date valuation in line with local conditions and the bigger market picture. It is a wonderful opportunity to discover a home’s individuality and be trusted by homeowners with what might well be their biggest asset. Q.: What would you like local homeowners to know about the current Clydebank market? A.: Now is an extremely good time to consider selling your property. There are many active buyers looking to buy, pretty much, all styles of property in ALL of the areas we cover and, with a distinct lack of these homes, the market demand is high which usually equates to fantastic prices being achieved. 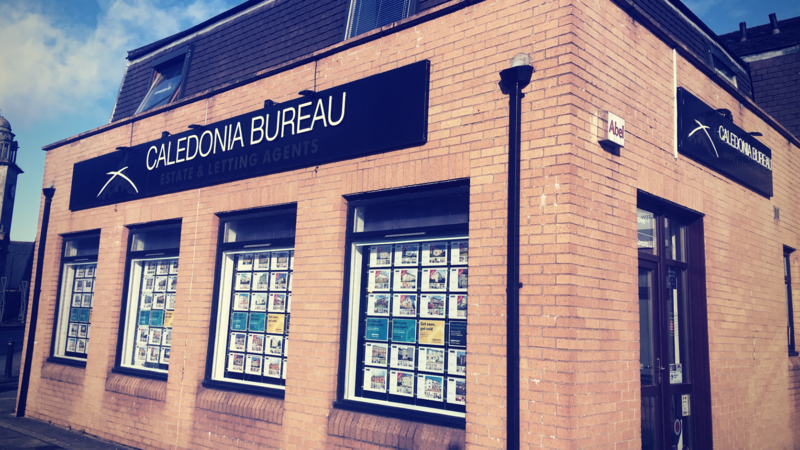 The team at Caledonia Clydebank have been witnessing many closing dates with multiple offers and swift and successful sale prices being achieved well over asking prices and home report values. Q.: What are your tips for current property sellers? A.: A property that makes a great first impression will generate more interest and secure more viewings, improving your chances for a quick successful sale. So make sure your property is as well presented as possible – if a job needs done, do it! Tidy the garden, fix the shed, mend the fence, paint that wall, change that rug, shampoo the carpets, buy those flowers and candles – throw a cushion! Attention to detail is key and whether you like it or are aware of it – viewers notice it all. Q.: What motivates you the most in your daily job? It may sound like ‘that old cliché’ however, I do like making people happy – be it sellers, buyers, colleagues on the phone, in the office or out at properties. There is a real buzz at the moment in our Clydebank office – with a good, active market come good vibes too. Sure, we are extremely busy from the moment we arrive to whenever we leave, but being able to work with a smile on your face and actually enjoy what you are doing makes everything and everyone work better together and the job easier too. Q.: How do you relax after work? A.: Much as I enjoy my job at Caledonia, I do relish the time I spend away from the office with my gorgeous family. I am also a keen runner and enjoy feeding my other passion which is music – recording and playing in various live bands in and around the feisty and vibrant Glasgow music scene and occasionally, further afield. Q.: For you, home is…. Strathblane. On the couch with my wife, happy kids, a glass of red and a wee bowl of something tasty! As one of West of Scotland’s longest established estate agents, Caledonia Property have helped families in West of Scotland buy, rent, let and sell properties quickly, and with the minimum of hassle. Get in touch with our team on 0333 241 3333 today or send us a message to find out more.